El E 100 fue concebido como la base para una AAP, un vehículo antiaéreo, y un cazacarros. Sin embargo, su desarrollo nunca comenzó. 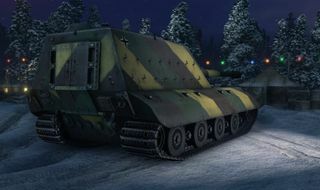 The JagdPz E-100 is the tier X German Tank Destroyer. Anyone who has been struck by the massive gun of this tank will tell you steer clear of it, if it happens to find you. This tank features a massive 170mm cannon that bears striking resemblance to the artillery gun on the GwTiger and GwTiger(P). Dealing an average of 1050 damage a shot, the JagdPz E-100 can strike fear into the hearts of even the bravest tankers in World of Tanks. The alpha of the gun has the ability to bring down even tier IX tanks with one or two shots. To balance the massive power of this tank, it has been given a horrid reload time, matching that of some artillery vehicles, so it is highly recommended that this tank be accompanied by a few others. The armor protection of this tank is actually quite good, the only true weak spot on the front of this monster is the lower armor plate, but when the tank is fought at an angle, even that can be difficult to penetrate. Never underestimate this tank, as doing so will cost you roughly half of your tank, if not all. The fact that anyone you meet will automatically spam premium ammo at you makes your armour virtually pointless. Unfortunately your size means three very bad things: first of all, your camouflage is downright horrible, you'll be spotted quite easily. Second, enemies will be able to hit you quite easily from afar, so try not to expose your weak sides. Third, artillery will have a feast with you if you are foolish enough to stay still on an open field. In May 9, 1944, at the meeting of representatives of the companies Krupp and Porsche, Krupp was asked to submit proposals for a super-heavy tank destroyer, mounting either of the 15 cm or 17 cm guns. 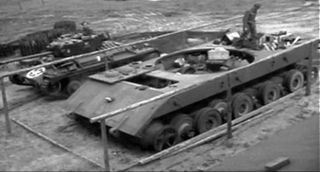 The first proposal were made that a variant was to be built on Porsche's Maus, with either of the 15 or 17 cm guns mounted on a fixed superstructure. With further discussion, it was said that a variant on the Maus would not be possible due to its height and weight, which would be impossible to transport by rail. The second proposal was made on Adler's E-100. The E-100 proved to be better than the Maus. Porsche, defending its project, the Maus, proposed that anti-aircraft guns would just be mounted on both tanks, but such an assembly would be terribly difficult. Therefore, Porsche decided to offer Krupp the development of a super-heavy tank destroyer on the E-100. Before development could even start, Adolf Hitler ordered that the development on super-heavy tanks were to be discontinued. No historical records exist of the Jagdpanzer E 100's design specifications, or of any plans to arm it with a 17 cm Pak gun. Development ceased before any armament was proposed for the tank.